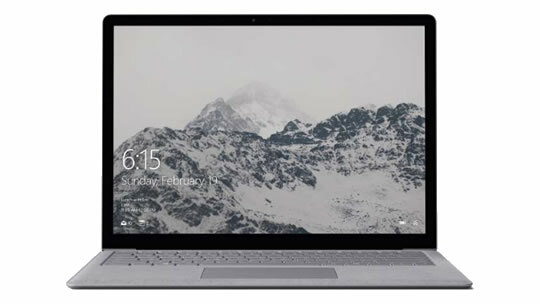 Surface Laptop is designed for Windows 10 S3 – streamlined for security and superior performance. Enjoy the Windows you know, Microsoft-verified apps delivered via the Windows Store and the convenience of the cloud. Surface Laptop complements your personal style with the blend of texture, subtle details and clean lines. Feel the luxurious touch of our Alcantara fabric-covered keyboard. The soft, durable fabric is treated to easily wipe clean and offers a comfortable typing experience. At just 2.76 pounds (1.25 kg), Surface Laptop fits easily in your bag and includes a 7th gen Intel Core processor to handle demanding desktop programs. Type comfortably with the soft palm rest, responsive keyboard and large trackpad. Enjoy immersive Dolby Audio Premium sound. Experience faster, easier, more natural navigation – with razor-sharp resolution for photographs, videos and presentations— on the vibrant 13.5-inch PixelSense Display with touchscreen. Enjoy more space for your ideas with an edge-to-edge display and ultra-thin bezel. Office applications install from the Windows Store and are currently in preview on this device. Must activate within 180 days. Offer ends 10/15/2017. Learn more about Office 365 Personal.